Easter is at the door, and people think about Lamb and chocolate, and therefore which wines are they going to pair with their Sunday late lunch or early dinner. Saying that I can think about 3-4 places in the world that specialize in great Lamb dishes. For someone from Bordeaux, like me, the first place that comes to mind is Pauillac, one of the most famous Bordeaux regions producing world-class high-end Cabernet Sauvignon based wines that encompasses 3 of the 5 First growth, 2 originally from the 1855 Bordeaux classification: Château Lafite Rothschild and Château LaTour, but also Château Mouton Rothschild (previously a 2nd growth, which became a 1st growth in 1973). So, why Pauillac will you say? Well, because, despite great wines, the region possesses another peculiar appellation, locally known as the AOC “Agneau de Pauillac” (also locally called “Agneau de Lait” or milk feeding baby lamb of Pauillac); and yes, AOC are also attributed to food in France (not only wines): All French Cheeses are under AOC, “Poulet de Bresse” (or “Bresse” chicken) is also another recognized label, amongst many more, under the important and now firmly established French “AOC” quality factor and indicator. “L’Agneau de Pauillac” is worldly estimated, and except the various delicious Lamb recipes that my wife and I make at home, the best one that I ever had was at “Cordeillan Bages”, the most famous and luxurious Hotel-Restaurant-Château of Pauillac, owned by the Château Lynch-Bages Cazes family and part of the “Relais & Chateaux” group, where the “Agneau de Lait de Pauillac” is cooked three different ways, under the supervising eyes of the iconoclast Chef Thierry Marx. “Agneau de Pauillac” is a baby lamb, usually killed before the age of 80 days, which feeds on the milk of ewes grazing on the salt marshes of the upper Médoc, along the bank of the Gironde River, north of Bordeaux. The Gironde estuary tide’s flux and reflux often flood the pasture of fresh grass bordering the Médoc bank, depositing some salt in the grass that is said to flavor the meat, but doesn’t make it necessarily salty. And as you may know, the sheep are greedy, really greedy ... in addition to eating all the time, the ewes of Pauillac have their preference: salty and fresh grass in summer, beans and carrots in winter. Regarding their babies, at the end of their lives, which usually do not exceed 75 days, the baby lambs feed on a mixture of molasses, sugar cane and grain to give the meat a subtle flavor and finesse, which perfectly combine and complete the naturally slightly salty taste. This combination of flavors and characteristics of taste are now protected and ruled by “IGP” (“Indication Géographique Protégée” or Protected Geographical Indication) and more recently “AOC” (“Appellation d’Origine Controllée”) for lambs exclusively born and reared in Pauillac. Even if it is a bit late to get your baby lamb from Pauillac at your local “boucher” (one thing that you will never find for sure…except in Bordeaux), you can always go to WholeFood or Fairway or Citarella, or even order from FreshDirect.com and order your favorite piece of lamb. Once you’ve decided, you can cook a classic like “Leg of lamb with Pommes Boulangères” or “Rack of lamb with Tomates Confites”, or even “Marinated Baron of Lamb”, many pieces, and many recipes! Only con, if you want to enjoy the meat a little pink, juicy and tender, crisp and delicate, it is better to avoid a trip to livestock farm... too touching! Once you’ve got the lamb, even if not from Pauillac, I surely will advise you to pair it with a wine from Pauillac or the Médoc. 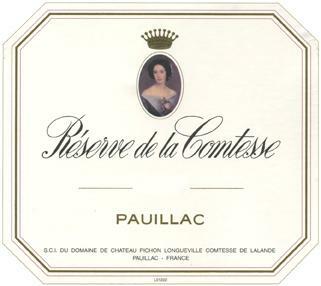 “Reserve de la Comtesse” is the second wine of prestigious 2nd growth Château Pichon Longueville Comtesse de Lalande, a classic of refinement in Pauillac, Bordeaux. Like most second wines in Bordeaux, Reserve de la Comtesse is crafted with the younger vines and the few batches that will not make the first wine. The same care and technology have been applied to produce it, yet it will always remain a reflection of the first wine. Somewhat similar, usually less complex and refined, yet offering great attributes and nuances. From the acclaimed 2005 vintage, this wine is a steal. A blend of roughly 49% Merlot, 27% Cabernet Sauvignon, 13% Cabernet Franc and 11% Petit Verdot, it exhibits bright ripe summer red and dark fruit on the nose with aromas of blackberries, plums and strawberries and characteristic cedar oak notes. The palate generously and elegantly reveals fine tannins, hints of mineral and wisps of earthiness wrap around the fruit on the palate. The finish is quite long and youthful with very good ageing potential. A great value from an incredible vintage. One of my favorites Pauillac, with Pontet-Canet, Pichon-Baron, Lafite Rothschild, Latour, Lynch-Bages, Cordeillan-Bages, Batailley and a few more. Fiefs de Lagrange is the second wine of Château Lagrange, one the greatest yet low key estates of Saint-Julien in the Haut Médoc region of Bordeaux. The estate which belongs to the Suntory group has kept its traditions of making juicy, fresh, earthy and food friendly Saint-Julien, rather than follow the trend of the over-extracted and overly oaky style of some of the neighboring Châteaux. Riper and fuller than its older sibling, the excellent 2000 vintage, the 2005 vintage is also a classic in Saint-Julien and Bordeaux overall. It offers very good balance and harmony, delineated by great acidity and essential tannic structure, lifting and framing respectively the ripe red fruit flavors and other components. Beautiful now, it will age nicely and gain in complexity and nuances. 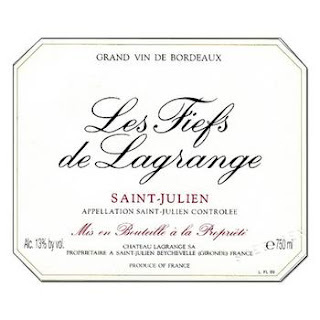 Surely one of my favorites Saint-Julien, with Langoa-Barton, and the three Leoville (Las-Cases, Barton, and Poyferré which has came a long way and now taste better than ever), and Gruaud Larose. I could continue with a long list of Bordeaux wines, but I think that you get the idea. After France, the 2nd country that comes to mind is Spain; with of course the tender suckling baby lamb, called "lechazo" (same as the French “Agneau de Lait”), which is a classic favorite dish of the Castilla-Leon region. It is roasted until crispy on the outside and so tender on the inside, that the meat is literally melting in your mouth. Enhance the taste of it by pairing it with some Tempranillo based wines from Rioja and Ribera del Duero. “Cochinillo”, better known as suckling pig, is also one of the greatest delicacies of Ribera del Duero (nothing to do with Lamb and Eastern, but always good to mention for the food amateur like me). Lamb in the USA is generally very large, since the most popular cut is leg of lamb. Lambs in the USA are slaughtered much older than it is customary to do in Europe. So, if you are unable to buy a suckling lamb through your local butcher, purchase a leg of lamb (bone-in). A braised rack of lamb or grilled lamb chops will be nice too. Marques de Murrieta has been making classic style Rioja wines since 1852 and continues to be one of the leading wineries of this region. 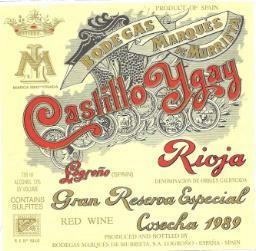 From the excellent 2001 vintage in Rioja, "Castillo Ygay", a Reserva Especial cuvee made in a Gran Reserva style, is dense and smooth, complex, rich, balanced and very subtle. Ripe red cherry, oak, spice, forest floor and floral aromas resume the nose. On the palate, it expresses flavors of dark berry and red cherry intermingled with hints of spice, earth and cider oak with integrated vanilla oak touch. The elegant mid-palate has a great acidity elevating the juiciness of the fruit and carrying it until the long-lasting dry finish. Very young yet expressive and approachable with great tannic structure and a lot ageing potential, it is a keeper. One of my personal Rioja favorites, with Lopez de Heredia, CVNE, Muga, Sierra Cantabria, Marqués de Riscal, Bodegas Riojanas, La Rioja Alta, and many more. Azienda Arzuagua is a traditionalist, terroir-oriented and organically farmed winery neighboring Vega Sicilia and producing earthy, intense and age-worthy Ribera del Duero. The 2004 Reserva is surely one of their most accomplished wines of this decade. It is deep dark red in color with brick reflects. Smooth and complex on the nose, it offers both dark and red cherry aromas as well as a woodiness and earth. It is rich on the palate with present yet integrated tannins; it still retains its fresh pure fruit characteristics complementing its rich, dense and earthy palate. Still very young and promising, it should be kept it for a little while longer or decanted before serving. After about 40 minutes of decantation, it was delightful. One of my Ribera del Duero favorites, with Vega Sicilia, Alion, Mauro, Pesquera, Emilio Moro, Alonso del Yerro, Alenza, Pingus and Viña Sastre, and many more. There again, I could continue for a long list but get the picture too. The 3rd country is New Zealand of course. They have some of the best lamb dish in the world. Their Pinot Noir(s) are the most appropriate. Other countries like Scotland and Ireland also have some of the best Lamb around, but they do not produce wines, although you can still have a Guinness or an aged single malt with lamb, I doubt that it will be the best food pairing. There are so many other countries that are cooking great lamb recipes and so many more wines that I would like to talk about, but I think I will stop here for today. And before, I forgot, for chocolate, it is quite easy, and as I mentioned them in some of my previous post, a “Banyuls” or a “Bugey Cerdon” semi-sweet sparkling rosé will perfectly do the trick. Some people may think about sweet Tannat from Uruguay which is also a fantastic choice for Chocolate, but you can also try some of these classics: a "Rasteau" (Rhône) or a Maury (Roussillon) or a Vintage Porto (Portugal) or even a Sherry (Spain), like "East India" from Lustau, one my favorites Palomino-Pedro Ximenez based sherry to pair with chocolate. Don José Ruiz-Berdejo founded Emilio Lustau (SA) in 1896. In the beginning, Lustau was essentially an Almacenista, a modest estate with small holdings that sold most of its wine to large exporting Bodegas. It was not until the 1950s that Lustau became Emilio Lustau SA, and it joined the prestigious ranks of a select group of exporters of Sherry. In the early 1980s, Emilio Lustau SA, then under the management of the late Rafael Balao, became one of the most innovative companies in Jerez, launching the "Almacenista" line and creating the distinctive bottle that we know today. Lustau is now widely considered one of the finest producers of Sherry, with their Almacenista line breaking new ground in handcrafted, boutique wines. These Sherries, drawing on rare and marvelous wines held by small producers, are some of the finest Sherries made today. Lustau offers a wide array of Sherries from the bone-dry Finos that are wonderful matches with garlic-y shrimp and langostinos. Racy Amontillados balance power with finesse and are wonderful with nuts, olives, cheeses, and jamon Serrano. Powerful Olorosos can be served during a meal and match well with traditional soups and stews. Of course, the wide range of dessert wines from Lustau are unparalleled; the elegant East India Cream Sherry is as soft as silk, the Moscatels offers a delightful citrus edge that keeps the wines lively on the palate while the dark Pedro Ximenez is best served as a “syrup” over vanilla ice cream, pancakes or waffles. Dating from 1896, the house of Emilio Lustau is arguably one of the most important names in the world of sherry. And “East India” is perhaps the best value dessert wine in the Lustau portfolio. This extraordinary Cream Sherry seeks to replicate the ancient style of Cream Sherry that was discovered quite by accident. Trading ships sailing to the Indies in the 16th century frequently carried butts (barrels) of sweet sherry lashed to their decks or in their holds as ballast. After travelling through the tropics, it was discovered that the heat and humidity had matured the wine and given it a wonderful smooth texture. Lustau has recreated this process by heating and controlling the amount of air allowed in the warehouse where the East India Solera is matured. The result is an exceptional dessert wine with a smooth, sweet taste reminiscent of figs, coffee, caramel and nuts and just enough acidity to give it balance. East India is a blend of reserve soleras averaging 15-20 years of age; it has aromas of dried fruits and spices and a creamy, soft and silky, spicy texture. Classified somewhat between a Cream Sherry and an Oloroso, yet a sweet and harmonious one, it is a quite unique style of Solera Reserva that is best served at the end of a meal, accompanied by dried fruits, nuts, and blue cheese, but also chocolate or alone as a digestif.